In celebration of Women’s History Month and International Women’s Day, this is the first in a series of installments from Smithsonian Institution Archives staff highlighting women in science photographs. We will post portraits of women science here throughout the month. Formidable (adj). Having qualities that discourage attack; tending to inspire awe or wonder. What a word! Sometimes, I come across a photo like the one on the left – it’s not a girlie, studio portrait; her gaze is steady and direct; her dress and hairstyle are rather daring; and, she exudes confidence and ease in her own skin – and I get all fired up to know more about her. “Who is she?” “What is her field?” “When and where was this portrait taken?” So I get to work and find out she’s Biologist Muriel A. 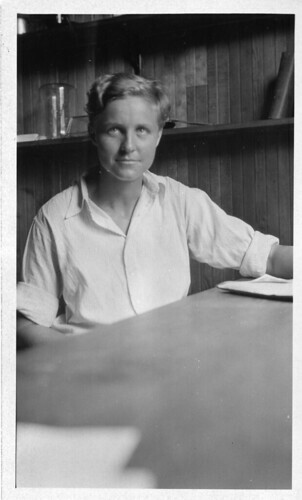 Case (1901-1981) who studied at Boston University and was doing research in biology at Mt. Desert Isle laboratory when this photograph was taken in the 1920s. Smithsonian’s Custodian in Charge of the Herbarium at the U.S. National Museum. She was not only an eminent expert on grasses but also a suffragette. In fact, her political activities resulted in arrests, prison time and a hunger strike that ended when she was force-fed. Later, when faced with formidable professional opposition to her request to go on expedition to Panama, she raised her own funds and traveled alone [shocking]. 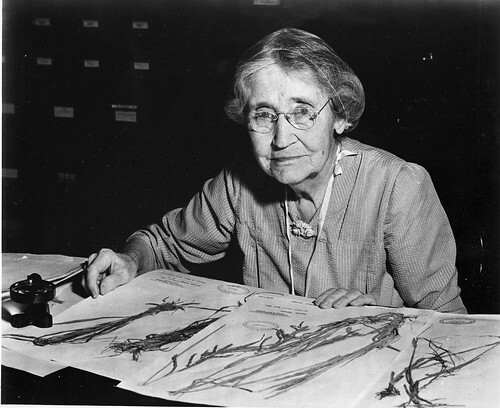 Throughout her career she was energetic and undaunted by political and professional chauvinism in pursuit of her passion for botany and at the age of 93 published a three volume index of U.S. grasses, over 80,000 species. The more I learn about the struggles faced by these pioneering women scientists the more I’m inclined to recall the word used above. Now you may have some sense of what I experience as I research women scientists represented in the Science Service morgue files – more on what these are in future installments.